Geckos—small to medium sized lizards with shiny bulging eyes—are the largest animals able to scale smooth vertical walls. They sometimes squeak, chirp, growl or make teeny noises but despite all this they have the most uncanny ability to cling, skirt, stroll or even bound upside-down on a ceiling, and basically navigate walls of any material, slick or not. Larger animals have had to develop alternative tactics to help them climb, such as using claws and toes to grip with. Geckos have these cool clinging toepads. Covering the pads are lamellae (Latin for small plate or flakes) of overlapping thin scales covered with hairs, best seen with a microscope. The hairs serve as a bond because when they contact a surface, they create friction, which is like adhesive. Now with a million clinging hairs, you have incredible strength for hanging on. Besides that, geckos have curved toe pads. Flat toes would mean the entire surface of their feet would adhere, and the geckos would not be able to lift their legs. Because of the curved shape, only a portion of the footpad contacts the substrate at any one time. By rolling their toes, geckos can quickly and repeatedly coordinate the movement and placement of their feet as they walk or run. This neuromuscular coordination is an inherent talent. Researchers who have studied animals that climb from the smallest mite to tree frogs know that as the body size of the animal increases, their adhesive footpads increase. This limits the animal that can climb because for a big animal, his feet would have to be humongous. Dr David Labonte, another colleague, found that tiny mites use approximately 200 times less of their total body area for adhesive pads than geckos. Humans would need about 40 percent of our total body surface, or roughly 80 percent of our front, to be covered in sticky footpads if we wanted to do a convincing Spiderman impression. Scientists at the University of Massachusetts in Amherst found out another important factor that aids the gecko in his climb—his body posture. As these lizards grow bigger, a gecko’s body became stiffer. 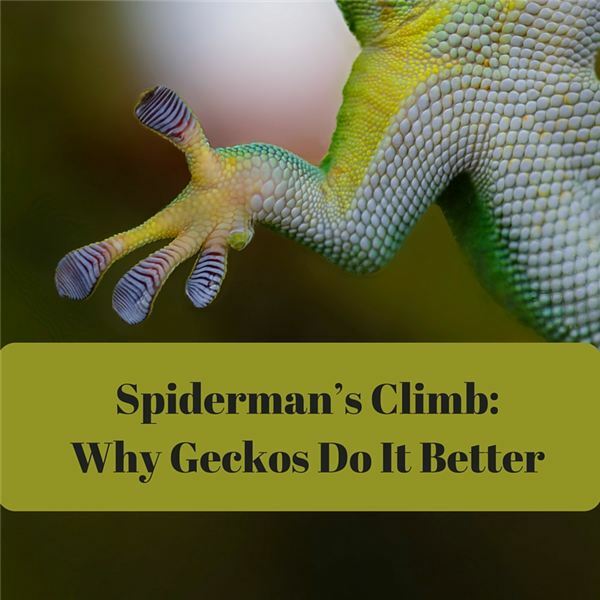 The researchers were actually studying the simple mechanical changes in adhesives when they found that the gecko’s stronger, stiffer body gave their adhesion ability a better support for more weight. “These results certainly challenge the prevailing view that as geckos become larger they achieve higher adhesive forces simply through having larger toepads,” Professor Irschick explains. As the gecko’s body size got bigger, the tendons, connective tissue, skin and tiny hairs—referred to as setae—became stiffer, acting as a spring with increased power. After years of study, researchers at the University of Akron in Ohio found that phospholipids, thin oils excreted to keep the gecko’s keratin hairs clean helps with stickiness. This type of fluid maintenance on their feet serves as a temporary contact adhesive between the geckos’ toes and the surface on which they are walking. In a study published in Journal of the Royal Society Interface, the team uncovered the phospholipids using a technique called “surface-sensitive spectroscopy.” They found a kind of near-invisible residue in the gecko footprints. Dubbed superhydrophobicity—it actually means extremely water-repellent. If the geckos didn’t keep their feet clean in this manner, it might have them slipping and sliding and vulnerable to predators. Researchers from the University of California, Berkeley, unearthed a discovery that could supply information in the development of improved climbing robots and unmanned gliding vehicles. They discovered this phenomena while watching high-speed video of the gecko’s acrobatic agility and found his tail told the tale. Bob Full, director of UC Berkeley’s new Center for Interdisciplinary Bio-inspiration in Education and Research, says they observed geckos climbing slippery surfaces and when it lost its footing, the creature would press its tail to the wall to prevent itself from slipping backwards while it recovered its grip. The animal’s tail acted as a kind of fifth foot during perilous falls. Crossingham, John and Bobbie Kalman. Extreme Climbing: Extreme Sports No Limits! New York: Crabtree Publishing Co., 2004. Book.